Writerly Ramblings: Vote for CHASING SHADOWS! 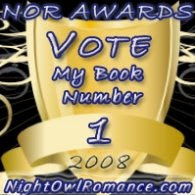 Incredibly, CHASING SHADOWS was nominated for the 2008 Night Owl Romance Awards for Best Mystery/Suspense Romance. I'm very honored and pleased about this nomintation since this was my debut book. Click on the icon at the left and cast your vote. I'm up against a lot of big talent, so all votes are much appreciated! THANK YOU!